Tottenham sign Clinton Njie from Lyon Tottenham Hotspurs have announced the signing of young forward Clinton Njie from French side Lyon. Tottenham Hotspur have announced the signing of young forward Clinton Njie from French side Lyon. The 22-year-old has signed a long term deal at the White Hart Lane which will keep him until the summer of 2020. Spurs sealed his deal earlier today after sending Roberto Soldado back to Spain. The Spaniard has now completed his move to Spanish side Villarreal. Njie who turned 22 today will now be a second striker of the first team. He is likely to be used as a backup striker for the Englishman Harry Kane. Meanwhile, the other senior striker Emmanuel Adebayor has not been given a squad number as the Togo international has been busy throughout the summer. Njie who has been in link with Spurs since long is just now waiting to get a work permit. The Cameroonian has netted six goals in 11 appearances for his country.. While for the club, he scored eight goals in 43 appearances in all competitions. 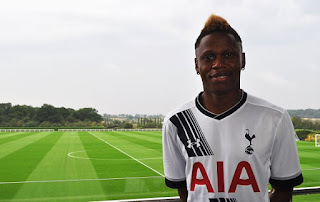 Njie who was also targeted by the other London side Arsenal became the fourth summer singing for the Spurs. Toby Alderweireld, Kevin Wimmer and Kieran Trippier are the other three player who have sealed the move.